Berklee student Michal Skrzypek was walking past the Christian Science Plaza one afternoon when a row of silver-and-green bicycles caught his eye, docked near what looked like a solar-powered ATM. Intrigued, he paid $5 for a 24-hour Hubway pass and took his first bike ride in Boston. That was 16 months ago. Skrzypek kept pedaling — to class, to see his girlfriend in Allston, to run errands, to explore back alleys and new neighborhoods — and in late November became the first customer to ride Hubway 1,000 times, hitting that mark a few days before the bike-sharing system closed for the winter last week. For Skrzypek and thousands of others, Hubway has provided both transportation and recreation — cheaper and more direct in many cases than the ­MBTA, better exercise than a cab, often faster than a car in rush hour — and has become a staple of city life. Hubway recorded 533,755 rides before shutting down for the season Wednesday night, pushing the cumulative total to 676,044 since its July 2011 launch, roughly 50 percent better than planners had hoped. Now, officials are envisioning a future with Hubway running year-round and fanning out across all Boston neighborhoods and many surrounding communities, beyond the current 105 stations — 72 in Boston, 22 in Cambridge, eight in Somerville, and three in Brookline — and 1,003 bicycles. “Everybody’s been calling,” said Jessica Robertson, transportation coordinator for the Metropolitan Area Planning Council, which helped Boston launch Hubway and expand across municipal borders for its second season. Cities as far off as Pittsfield and Portland, Maine, have inquired about starting satellites, while local communities, starting with Newton, want to tie into the existing map. 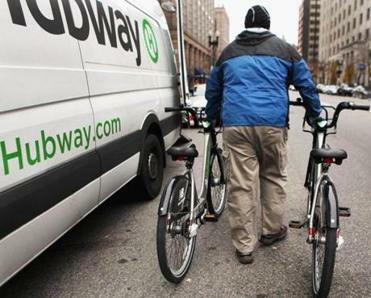 A typical station with bikes costs about $50,000 and requires $10,000 in annual subsidies, though operations are expected to be covered fully by user fees and advertising as Hubway matures. Those costs make expansion contingent on grants, private sponsorship, and local taxes, and the outward march is incremental — far-flung stations do not succeed in a system designed for short trips and rapid transit. But a winterized Hubway could happen by December 2013. Current contracts and permits call for a nearly four-month closure, but the two-thirds of Hubway stations located on plazas and sidewalks could remain in place without posing an obstacle for street plowing. Local officials followed the lead of established bike-sharing networks in Montreal and Minneapolis in making Hubway seasonal. But Toronto’s BIXI, which opened the same year as Hubway, has kept going through the cold, encouraging ridership with “Winter Warrior” contests. All four of those cities, as well as the year-round Capital Bikeshare in milder Washington, D.C., use bicycles and stations manufactured by the Montreal firm PBSC. Hubway and Capital Bikeshare are operated by the same company, Alta Bicycle Share, which maintains the equipment and moves bikes around to balance commuting patterns and prevent stations from being full or empty for more than a few hours. Berklee student Michal Skrzypek made more than 1,000 trips on a Hubway bicycle this year. Since its launch, Hubway has had just one reported accident with serious injuries, when a rider sustained broken ribs and a concussion after being struck by a shuttle bus that ran a red light near the CambridgeSide Galleria in October. That has helped quiet skeptics, as Hubway has evolved quickly from European-style urban experiment to established, and expanding, local infrastructure, said Scott Mullen, Hubway’s general manager. “People say, ‘Oh, you work for Hubway? What is this, like, your fourth year?’” said Mullen, who is employed by Alta but works closely with the cities and towns that host Hubway and own the equipment. 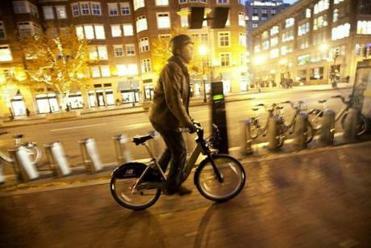 Hubway has encouraged new cyclists, contributing to a growing bike culture. That trend has come with some growing pains — flare-ups and collisions between drivers and non-Hubway bicyclists — but has been promoted by officials, who cite environmental, fitness, quality-of-life, and equity reasons for making room for bicycles as well as cars on roads paid for by all taxpayers. The city’s annual bike census, taken each fall at consistent intersections across Boston, showed a 31 percent increase in cycling from 2010 to 2012, said Kris Carter, interim director of Boston Bikes, which launched and helps oversee Hubway. Mullen said Hubway has broadened what it means to be a cyclist, beyond environmentalists, Lycra-clad racers, and fixed-gear hipsters. For Skrzypek, the Berklee College of Music student, Hubway is faster and more affordable than the MBTA. Annual membership costs $85 — compared with $70 a month for a T bus/subway pass — and he earned a second year free by tallying the third-most rides in 2011, before pedaling past the pack this year. Kenji Quinn removed bicycles from a Hubway station on Boylston Street as the program shut down its 105 locations and picked up its 1,003 bicycles for the winter. “It’s nice not being stuck in a train to get somewhere, actually being able to see everything and feel the outside,” said Skrzypek, after a trip from Back Bay to Brighton on Monday that pushed his total number of rides to 1,015. For private banker Tom Loucas, Hubway has replaced as much as $200 in weekly taxi rides and helped him shed 50 pounds, down from 315. He started with a neighborhood spin in summer 2011, after discovering his wife’s unused membership key soon after the system opened. “That was to put my pinkie toe in,” Loucas said. A test commute on a casual Friday gave way to the daily sight of the 50-year-old banker in suit, dress shoes — and, in the rain, knee-length Brooks Brothers overcoat — pedaling the mile and a half between his South End home and Financial District office. Now, he rides to client meetings as well. Loucas is not shy about telling Hubway it should lower prices — the original membership was $65 — to attract more riders, and the real-time app showing station location and capacity does not work for his BlackBerry. But those are minor complaints from a man whose enthusiasm has convinced several colleagues to sign up. At this time next year, he may get to keep riding.